Bernice E. Muench, age 86 of Lancaster, WI, passed away Thursday, January 24, 2019 at Orchard Manor Nursing Home. She was born March 27, 1932 in Lancaster, the daughter of Joseph and Mary (Fuerstenberg) Hahn. Bernice married Carl Muench on June 29, 1957 at St. Clement Catholic Church. 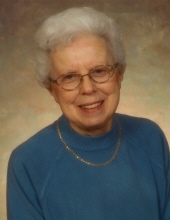 She was a faithful member of St. Clement Church, and in her earlier years, was the co-chairman for the Fall Festival and worked with the food commission. She was also a member of the Grant Regional Hospital Auxiliary and did volunteer work for the Grant County Thrift Shop, Food Pantry, and Meals-On-Wheels. Bernice retired from the M&I Bank in 1995, where she was an internal auditor. She later worked for Nova Directories, retiring in June 2017. In her free time, Bernice belonged to a couple Euchre clubs, and enjoyed playing bridge, watching the Packers and Badgers, and working in her lawn among the flowers. Bernice is survived by one sister, Dolores Schwantes; a sister-in-law, Eileen Stelpflug, and many nieces and nephews. In addition to her parents, Bernice was preceded in death by her husband, Carl, in 1993; a brother, Leo Hahn; sisters: Irene (Harold) Bennett and Phyllis (Donald) Schmit; brothers-in-law: Leo, Donald and Gerald Muench, Cletus Stelpflug, LeRoy Peterson, and Alan Schwantes; and sisters-in-law: Helen and Madelyn Muench, Sally Peterson, and June Hahn. A Mass of Christian Burial will be held at 11:00 a.m., Tuesday, January 29, 2019 at St. Clement Catholic Church in Lancaster with Fr. William Vernon officiating. Burial will be in the St. Clement Cemetery. Family and Friends may call from 4:00 p.m. until 7:00 p.m. on Monday, January 28, 2019 at St. Clement Catholic Church, where a 3:45 p.m. Rosary will be prayed. Visitation will also be held on Tuesday, January 29, 2019 from 10:00 a.m. until time of services at the church. In lieu of plants and flowers, memorials are preferred, with proceeds going to the St. Clement School Fund, the Grant County Cancer Coalition, the Lancaster Fire Department, and the Lancaster EMS. The Martin Schwartz Funeral Home & Crematory of Lancaster is entrusted with her services. To plant a tree in memory of Bernice E. Muench, please visit our Tribute Store. A Rosary will be prayed at 3:45 PM. "Email Address" would like to share the life celebration of Bernice E. Muench. Click on the "link" to go to share a favorite memory or leave a condolence message for the family.